Our Shaker blades are designed for maximum vibration. Large holes in these blades provide free swimming action. To rig our Shaker blades, use a #3 split ring to add the shaker swimming style blade to any jig, bottom bouncer, worm harness or other lure and use a # 2 Duo Lock Snap for a line tie. Small: 1-1/8" long X 7/8" width. Use on jigs from 1/8-3/4oz. Medium: 1-1/2" long X 1-1/4" width. Use on jigs from 3/8-3/4oz. Large: 1-3/4" long X 1-7/16" width. Use on jigs from 3/4-3oz. Made from stainless steel for stronger vibrations. Easy to paint or apply Prism tape. 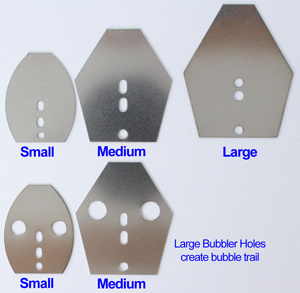 Bubbles holes create a bubble trail as you retrieve your lure. 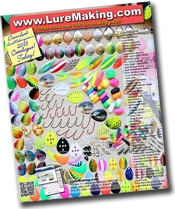 Use our lure tape to add colour to your finished lure for added attraction. Manufacturer has closed shop. No longer available.